Laminated composite materials have been used since the 1960s for structural applications. This first generation of materials were successful because of the materials' high stiffness and strength performance. 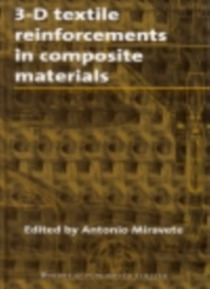 The aims of this book are to describe the manufacturing processes, to highlight the advantages, to identify the main applications, to analyse the methods for prediction of mechanical propertie… s and to focus on the key technical aspects of these materials in order to discover how better to exploit their characteristics and to overcome their disadvantages in relation to the laminated composite materials.This book covers many areas related to 3-D fabric textile technologies, and manufacturing is treated as a key issue. Theoretical aspects of micro- and macromechanics are covered in depth, as well as properties and behaviour. Specific techniques including braiding, stitching and knitting are described and compared in order to evaluate the most attractive configurations available at the moment. Present and future applications and trends are described to illustrate that 3-D textiles are part of the real industrial world not only today but tomorrow as well.